The feeds are subscription based so you need to add the URL provided when subscribing to your own calendar. Notes and Categories are integrated for increased transparency and functionality. Any notes you choose will be pushed to the local calendars along with the rest of the feed. There are Four places where you can subscribe to the feeds in the interface. In your Profile page you can subscribe to your own feed. 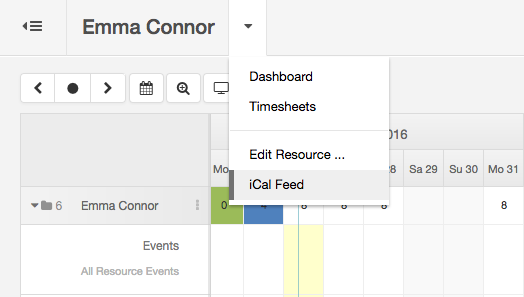 In the sidebar there is a small arrow to the right of each element with an option for an iCalendar Feed. In the sidebar beside each group name there is an arrow with the group feed option. Above the grid where the name is displayed there is a small arrow to the right allowing you to subscribe to each feed you are in. To keep the loading nimble and fast we load bookings which have an end date within the last 30 days. They are real time sync’ed but it is up to you to set your calendar settings how often it refreshes the feed.